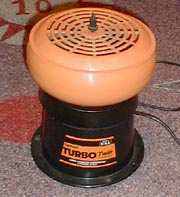 If you read the usenet group rec.games.pinball or visit american pinball repair websites you've probably read about a 'tumbler' or 'vibrating polisher'. Here's a bit of explanation about them and my experience with it. A tumbler or vibrating polisher is a machine to clean and polish metal parts. Both words are used, or used for the wrong type of machine. - A tumbler is a closed round box that rotates. The box rolls around the whole time. - A vibrating polisher is a bowl that sits on top of a vibrating block/motor. The parts don't roll around but vibrate up and down all the time. Usually people say tumbler to both kinds of machines. It seems that the second type of machine is easier to find. Both types work as well. Using a tumbler is easy: put the metal you want to polish in a box with tumbling media, switch it on, and let it rotate/vibrate for hours or days. The media rubs against the metal, removes dirt and polishes. Everyone will already have a way to clean metal, using steel wool, or automated by using a brush on a drilling machine, but the advantage of a tumbler is the ease of use. Throw the parts in there and let it do the work. And it's very good on small and irregular shaped parts like screws, something which is very dangerous or time-consuming to do otherwise. For large parts (metal ramps, ball guides) it's less suited as the bowl isn't always large enough, but for small parts a tumbler is ideal. In Europe tumblers are available in better gun stores. Gun-owners use them to clean shells so they can reload them. In the USA they're easier to find and other versions like rock tumblers (for cleaning rocks) are also available. On rec.games.pinball the Berry's tumbler is most widely known, especially because it only costs around $50 in the USA and is of good quality. In Belgium or the Netherlands this type is not available, I only found a dealer in Germany, and a friend in the UK also was able to buy them but needed to order a dozen at once. Some people now also use a Dillon tumbler, as it has a much larger top so you can tumbler larger parts and more at once. Gun stores in Belgium do sell Lyman tumblers. These are of excellent quality. Prices are (much) higher then in the USA, the cheapest I found (depending on the US$ was between 100 and 130 euro ($120 to $150). More expensive dealers even asked up to 170 euro ! 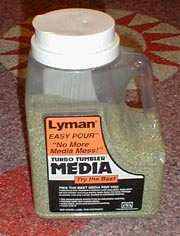 I bought a Lyman Turbo Twin tumbler a the end of 2003. The engine base is the same for all Lyman models, only the bowl is different. The twin version comes with 2 bowls of a different size (but I've only used the larger one). If you buy a tumbler, you also need the 'media' for it. I paid 10 euro for a small box (1 kg, just enough to fill the large bowl halfway), or 25 euro for a large box of 3 kilogram Lyman corn cob media. The prices are just as an indication, they are different between stores and also depend on the US$ value, but at least you have an idea about costs in Belgium. There are different kinds of media. Most used are corn cob and walnut shell, treated and untreated. Walnut shell is very hard and good to clean metal, and can even remove scratches. It's however less suited to polish and is maybe too aggressive to use on 'soft' metal. Lyman sells Tuffnut media. This is media to which 'rouge' has been added, which makes it even more aggressive against rust and corrosion. Disadvantage is that it leaves red dust. So only use it on heavy rusted parts, and tumble the parts later with corn cob to polish them. Corn cob is more soft. It's suited for not too dirty metal and polishes very well. The treated corn cob by Lyman is green. Don't buy untreated media in a gun store, as the price difference with treated media is small but it works not that good. Normally treated corn cob is good enough to clean and polish all metal parts. There are however people that only use walnut shell media and mix it with Novus 3 or even with sand. You just have to try some different mixtures, it depends on the media which you can buy easily/cheap, and if it's not good enough then you add something to it to make it better. There are other places to buy media than gun shops. In the USA corn cob and walnut is available in pet stores, where it's used to fill the bottom of bird cages. In Belgium I haven't found it yet, as people usually sell wood scraps for this. The sand/beads which are used for sand blasting should work very well. If you have a local source for that, give it a try. Sandblasting media is very coarse so don't use it on parts you want to get a smooth polish, it's better suited to remove rust. Plain uncooked rice is also a very good media that will last a good time. 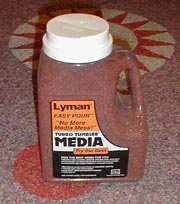 Especially suited if you have trouble finding expensive corncob media and are looking for a cheap alternative. You can add polishing agents to it such as brasso. Even if you haven't seen or touched media, you probably have a good idea now what it is: small pieces, hard and dry. As said above, using a tumbler is easy. Fill a bowl about three quarters with media, throw all your metal pieces in it, and switch the machine on. Let it run for hours/days and look once in a while to see the progress. The most important part is to make sure there is enough media in the bowl. The parts should be covered completely and must have enough room to tumble (not just lay on the bottom and vibrate). Don't mix different types of metal (flat parts, round parts, pointy things). Ie don't mix pinballs with screws, as the screws will make more scratches on the balls. Because the media is very dry, it's best to add something to it. You can use liquid car polish, chrome polish or Novus. The media will last longer and it'll put a protective film on the metal. A friend of mine tried tumbling very rusted pinballs. They looked as new, but a day later started to show rust again. He tumbled then again but added some car wax, and since then the pinballs look good and didn't rust. A tip if the media starts to become dirty (grey dust): let it run with some pieces of kitchen paper in the media. The paper will absorb a part of the dust. I even went through the media with a magnet, as it attracts metal particles. How long something needs to be tumbled, depends on how hard the metal is. Soft metal like bronze or copper (light bulbs, coins) are done after a few hours already. Very hard parts (leg bolts or pinballs) need multiple days. If you remove the metal parts from the tumbler it's best to clean it with a soft cloth to remove the dust. Tumblers are designed to be filled with (lightweight) brass shells. Do not overfill your tumbler so it is loaded too heavy ! It is better to split up parts and run multibple batches if they contain heavy parts. - Safecracker tokens: 2 hours in the tumbler and they looked as new. The difference was unbelievable ! - pinballs : these also give good results. Even old balls with small spots of rust you can get as new. Take care: only re-use old balls if they don't have any scratches, because that will damage your playfield ! Only polish rusted balls if they have small spots of surface rust. New pinballs can be polished also for an increased mirror look. That's how the 'Mirror Glazed' pinballs are that shiny btw - they are already high quality steel balls that are extra tumbled. Does your Twilight Zone have a grey powerball ? Tumble it and it'll become bright white again. - screws: small screws don't have many flat pieces so it's difficult to polish. But you get them clean. The media sometimes gets stuck between the thread so take care when you clean them. On large screws which hold plastic posts, and metal posts you get good results. But as they're of strong metal they need enough time. - Light bulbs: #44 bulbs out of old machines usually have corrosion but still work fine. One night in a tumbler and they look as new. And no, the vibration doesn't destroy them. Maybe a few won't light anymore, but those were weak anyway and would have burnt soon. So no need anymore to throw away light bulbs because they have bad contacts. - Leg bolts: these are made of very strong metal, you need to tumble them for many days. You will not get them as new (unless maybe you tumble first a long time with Tuffnut) but the head will be a bit more shiny. - Plunger assembly. Gives very good results. Bally pinball machines of the 70ies and 80ies have a small piece of metal with the Bally logo on it. You get this as new. The plunger itself and spring also btw. These are only a few examples of what I have tried. A tumbler will be invaluable when you're restoring a pinball machine which was in a slightly moist environment. All metal parts will then be corroded. Using a tumbler you can really get every metal part clean and look as new (even coin brackets, light sockets..), without spending many hours doing the work manually. I've tested a Lymann turbo twin and a Berrys tumbler. It's difficult to say which one I like better. The Berry tumbler has a bigger bowl, so it's suited for larger parts (like small ramps). But the shape of the Lyman bowl is much better in my opinion. While the media in the Berry tumbler just vibrates up and down, the curved shape of the Lyman bowl makes the media rotate also from the center to the outside. That seems more effective so it'll clean faster. If you tumbler large metal parts, make sure you fill the bowl with enough media. The parts should be covered completely so they can move around freely in the bowl and the media move over it. If there is not enough media the parts will stay stationary and not a lot will happen. Tumbling is only effective when the media moves around. A tumbler is a great machine to clean and polish metal parts. Once you have one, you'll clean more and more things with it. If you only have 1 or 2 dot matrix pinball machines in good condition, then you don't need to invest in a tumbler. It'll be cheaper to buy new light bulbs and pinballs, and clean other parts by hand. It only gets interesting when you often shop a machine and want to save a lot of time on manual work. Or if you will do a complete restoration and will only be happy if every part is clean and looks as new. Then a tumbler will be invaluable.